Ms. Love was selected for this award because of her work in the Germantown community for more than 30 years. Ines is currently the Program Manager of Faith CDC, a local community development corporation founded in 1981 with a mission to serve the lower income residents of the Germantown community, by operating a food bank which distributes food on a weekly basis and providing workforce development and job training skills to help residents become employed and contribute to the stabilization of the community. Faith CDC is one of the several RCO's (Registered Community Organization) in Germantown that are tasked with facilitating “public meetings" of appeal (to Philadelphia's zoning code) by commercial and residential developers and the community. Ms. Love is also a business owner and founder of Philadelphia Anti-Drug/Anti-Violence Network which provides direct outreach services and programs to low and moderate income families living in Philadelphia. Ms. Love has lived in the Germantown neighborhood for more than 30 years, and during that time she has advocated for programs that bring more job placement and training into the neighborhood and has worked to reduce the violence. One of the newest businesses to the district, Happy Bread Cafe opened in May of 2015, and has since become a gathering place for local residents to get a meal, hold a casual meeting and on Friday nights catch some of the hottest vocalists and poets in the Philly area during weekly Open Mic Nights that stretch late into the evening. One of the things that Happy Bread seeks to bring to Germantown is good food done well, and to help take the dining experience in the neighborhood to the next level. Happy Bread Cafe was founded and is owned by Zoe Rose. Ms. Rose has experience in working to turn around emerging business corridors as she was involved in working to turn around the Ogontz neighborhood through the Ogontz Ave. Revitalization Corporation (OARC) and she is a veteran of the hospitality and food service industries. Teen Leaderships Corps at Awbury Arboretum was started during the 2013-2014 school year with a mission to create a thoughtful and productive community of youth and adults from diverse backgrounds who work together to learn about food, farming, entrepreneurship, and each other. Their community works together to create urban agricultural based products and services and to learn essential business skills. TLC at Awbury Arboretum plants and sells seedlings, maintains a 50’x50’ market garden - The Uptown Farm; and tends and harvests 10 raised beds. 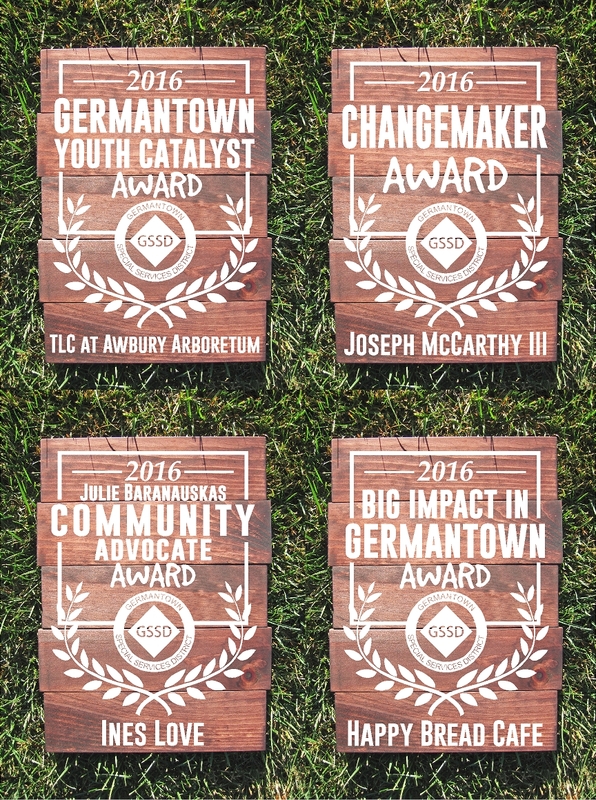 They also built and utilize a small unheated greenhouse and seek out creative ways to keep it heated.They provide youth with leadership opportunities and a place to learn and to earn.TLC is housed at Awbury Arboretum located in East Germantown. Joseph McCarthy III, is the President of Baynton Hill Neighbors, a civic association for a neighborhood located just outside of the southern GSSD boundaries. When the Clean, Safe & Beautification committee decided to partner with Curb Appeal and create our community based cleaning program called Curb Appeal Project, Joe was the first person to volunteer his neighbors to get involved. As the Curb Appeal Project is an all volunteer based program that uses no GSSD assessment generated funding, Joe and his group brought their own cleaning supplies to the first block clean up, setting the benchmark for other blocks going forward. Mr. McCarthy has been an active member of the Germantown community for more than 20 years, serving on boards and leading and participating in many groups that work to promote and effect positive change. A registered architect, Joe is a board member of Historic Germantown, volunteering his professional preservation services to member sites of the consortium.